We’d love your help. Let us know what’s wrong with this preview of Counterpower by Tim Gee. This timely book argues that no major movement has ever been successful without counterpower, or the power that the "have-nots" can use to remove the power of the "haves." 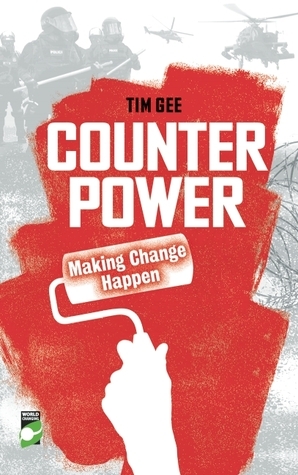 Investigating the history and tactics of major movements of the past and today's global justice and human rights movements, Tim Gee demonstrates what works and what doesn't work. In showing how counterpow This timely book argues that no major movement has ever been successful without counterpower, or the power that the "have-nots" can use to remove the power of the "haves." Investigating the history and tactics of major movements of the past and today's global justice and human rights movements, Tim Gee demonstrates what works and what doesn't work. In showing how counterpower can be strategically applied, Gee has created an inspiration for activists and an invaluable resource for teachers and students of social change. To ask other readers questions about Counterpower, please sign up. The author uses the notion of counterpower (i.e., the power of the people, of the oppressed) to explain the success or failure of social movements. He focuses on three kinds of counterpower: idea, economic, and physical. He argues that successful counterpower movements must engage power on all three fronts. He analyzes an array of historical social movements in terms of their uses of the various kinds of counterpower, including the Indian independence movement, the Anti-Vietnam War movement, the The author uses the notion of counterpower (i.e., the power of the people, of the oppressed) to explain the success or failure of social movements. He focuses on three kinds of counterpower: idea, economic, and physical. He argues that successful counterpower movements must engage power on all three fronts. He analyzes an array of historical social movements in terms of their uses of the various kinds of counterpower, including the Indian independence movement, the Anti-Vietnam War movement, the anti-apartheid movement, and the Egyptian movement. Strong, example-backed presentation of the fundamental types of counterpower that need to be developed before any protest movement can stand a realistic chance of success in changing the status quo. From a personal standpoint, particularly appreciated the point made about nonviolent tactics ("the means are the ends") leading to nonviolent regimes. I would have liked to have seen more discussion and analysis on coordination tactics, the building stage of the movement and fundamental link between c Strong, example-backed presentation of the fundamental types of counterpower that need to be developed before any protest movement can stand a realistic chance of success in changing the status quo. Great exploration of different struggles against existing power structures - the struggle for the vote in the UK, against apartheid in South Africa, against segregation in America, for Indian independence, to protect the environment against climate change, etc. Good insight into the different factors that influenced each movement and their successes and failures. Fun read, great concepts for those who are new to campaigning - and a very handy way of framing movements for those who have more experience. An in-depth exploration of the power of protest and how we can achieve change in society.